Disclaimer: The following information is given for guidance only. It does not legally bind FDA, German authorities or ILDA to any particular requirement or course of action. Also, for healthcare information about treating suspected or actual eye injuries, see this page. If there was no exposure, then I would not recommend that a manufacturer send an ARO Report to FDA. If an exposure exceeded the MPE, then yes that is potentially injurious and the manufacturer is required to report the number of persons involved, adversely affected, or exposed during the accidental radiation occurrence, and the nature and magnitude of their exposure and/or injuries. The ARO Report should also include any actions, if any, taken by the manufacturer to control, correct or eliminate the causes and to prevent reoccurrence. With regard to when the Report has to be submitted, the regulation says "immediately report" in 21 CFR 1002.20(a). Manufacturers should not wait until they have all the information we ask for in the ARO regulation, but should send in as much as they have initially and then supplement the report when additional information becomes available. All of the aircraft illumination incidents are AROs that are potentially hazardous and in many cases below the MPE. We don’t get ARO Reports for them because the laser product manufacturer is unknown unless the perp is arrested and the laser seized. Remember an FDA lawyer from OCC, I think, said the collateral hazards also count as laser hazard if they could happen as a result of a laser exposure (meaning loss of control of a vehicle or a crash). 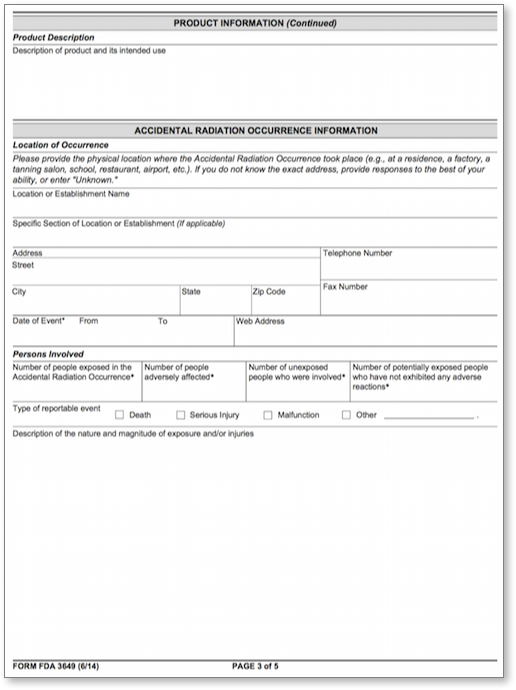 Page 3 of the 5-page FDA Accidental Radiation Occurrence Report form. ILDA has stored the June 2014 version which you can download here; you also may be able to get the latest version direct from the FDA website here. Some states such as Arizona and Illinois have requirements for laser incident notification. These two states' requirements are listed at the bottom of the "Reporting laser incidents and accidents" page. There may be other states with specific reporting requirements but ILDA has not researched this further. However, if someone was harmed or if damage occurred, the police must be informed. The people in charge would be held legally responsible and liable in case of non-compliance with laws and regulations. Issues about a show’s safety?